This is the best matcha white chocolate cheesecake recipe that you will come across. Smooth and creamy baked perfection with an Oreo base. 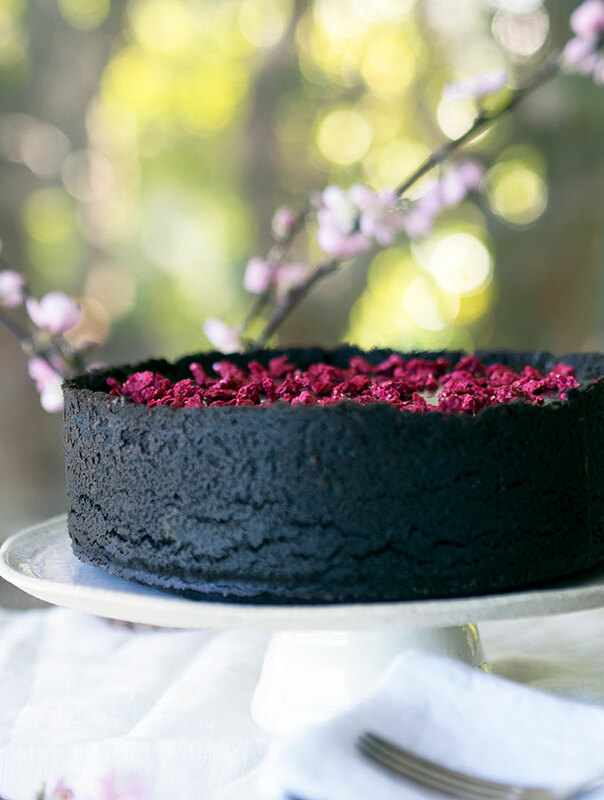 All topped with decadent dark chocolate ganache. I find that people either love matcha or really don’t think that much of it at all. You may also know matcha as Japanese green tea. Don’t mistake matcha with loose leaf or green tea in tea bags. It is finely ground powder from specially grown green tea leaves, and is used in traditional Japanese tea ceremonies called chanoyu or sado. Matcha can be fickle to use as an ingredient. Too much will make your dish bitter. Too little and you loose that recognisable green colour. It is a fine balance between taste and looks. I’ve found the perfect balance for my matcha white chocolate cheesecake. Not too much, but you still have that distinctive matcha colour. Enough for the matcha and white chocolate to harmonise and create something quite delicious. 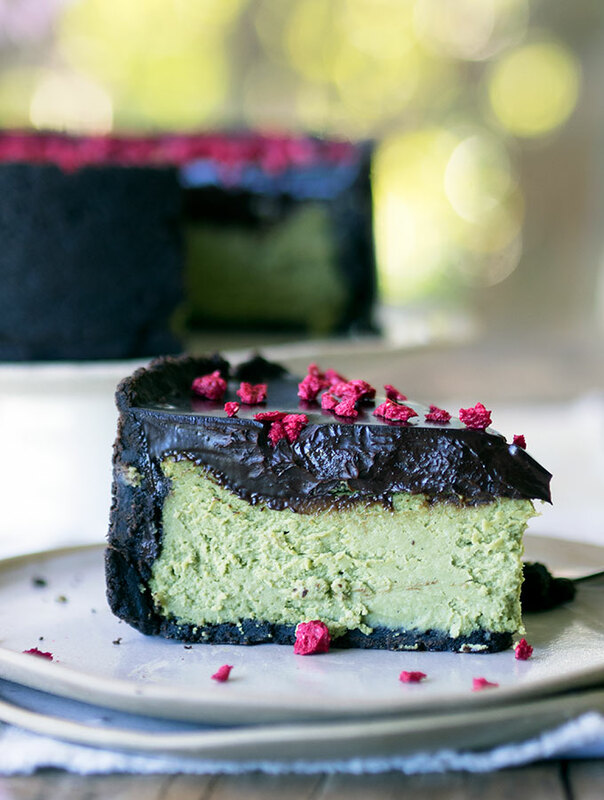 This matcha white chocolate cheesecake is baked. There are quite a few non baked cheesecake recipes on Belly Rumbles, Cheeselova, Strawberry Cheesecake, Lemon Myrtle Cheesecake. We were rather lacking in the baked department. This recipe is for those of you that hate using gelatine but still love a smooth and creamy cheesecake. The trick to the smooth and creamy texture of this baked matcha white chocolate cheesecake is baking at a low temperature and then leaving it to cool in the oven. I use salted butter in the crunchy Oreo base, as I wanted to add a slight saltiness to those sweet dark Oreo biscuits. 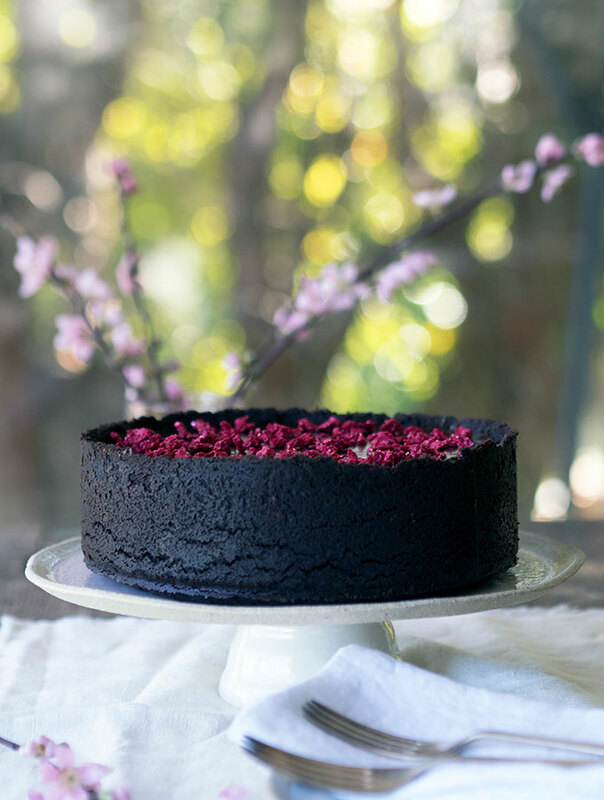 It really rounds out the flavours when you take into consideration the decadent dark chocolate ganache topping. I decorated the cheesecake with freeze dried strawberry granules. Please do not go running out to buy the granules unless you really really want to. I’m sure you have a friend that goes gaga over stationery and tends to purchase bits and pieces all the time. That’s me but with ingredients. I just happened to have some freeze dried strawberries in the cupboard (as you do……). If using freeze dried strawberries, place them on the cheesecake when serving. Otherwise they will go soggy after some time. I suggest fresh strawberries as the perfect alternative to top your cheesecake. You could also use grated white chocolate or shards/curls. We have some other delicious matcha recipes you will love; Matcha Financier Hearts, Green Tea & Lemon Myrtle Crème Brulee and Beer Battered Mushrooms with Green Tea Salt & Yuzu Mayonnaise. I am sure you are going to love my matcha white chocolate cheesecake. Visually a bit of a showstopper, which makes it the perfect cheesecake for those special occasions. Preheat oven 160°C (320°F). Line the base of a 21cm (8 inch) springform cake tin with baking paper. Blitz Oreos (with cream) in a food processor until they have formed a fine crumb. Put Oreo crumbs in a medium size bowl, stir through the melted butter. When crumbs and butter and thoroughly combined place in the lined spring form tin. Press crumb up the sides and along the base of the tin. I find using a flat bottomed thick glass perfect for smoothing out the surface and keeping it uniform in thickness. Once done place in fridge until required. Whisk caster sugar and matcha powder together in a bowl. Using a stand mixer or hand beaters, beat cream cheese, sugar matcha powder mixture and vanilla bean paste together until smooth. Add eggs one at a time, beating well between each addition until mixture is well combined. In a small bowl mix cornflour with 2 tablespoons of cream. Add cornflour slurry, remaining cream and melted white chocolate to the cream cheese mixture. Beat until well combined. Pour cream cheese mixture into prepared Oreo biscuit base. Place springform tin on a lined baking tray and place in oven. The baking tray will catch any butter that leaks from the tin. Bake cheesecake for 50-60 minutes, until it is set in the centre. Once cheesecake is cooked through turn the oven off, and leave the cheesecake in the oven, with the door ajar for a further 2 hours or until cooled. 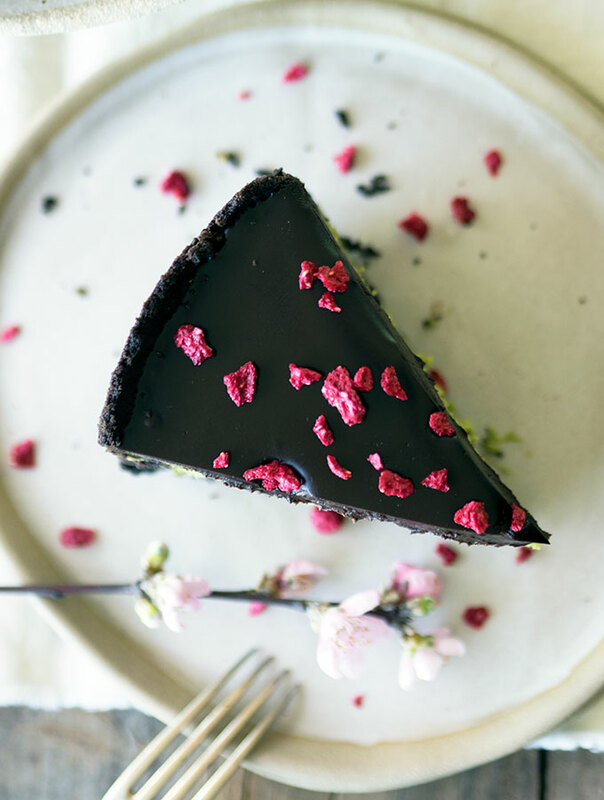 Once cheesecake has completely cooled top with dark chocolate ganache. Place cheesecake in fridge for a few hours to chill before serving. To server remove cheesecake from the springform tin. Decorate with freeze dried or fresh strawberries. Place thickened cream and chocolate in a saucepan. Over a low heat stir until chocolate has melted and the mixture has combined completely. Leave to cool for a minute before pouring over the cheesecake. « The Peninsula Manila Review & the Best Halo Halo in Manila? I made this cake today for a birthday. By the time it was done baking, there was no room in the pan for ganache so I made a cardboard collar wrapped in plastic wrap, tucked it into the pan, to contain the ganache. Worked wonderfully! The vanilla bean paste I ordered on Amazon smelled strongly of alcohol but was not detectable in the cake (thankfully). I did not feel the vanilla and matcha flavors were noticeable, but my boyfriend (birthday fella) did. The colors are great, the textures are perfect, and it’s delcious overall. Thank you for sharing this recipe! Could you be more specific with which cream you’re using where. You list cream and thickened cream in the ingredients, but then just say “cream” in the recipe. Hi B, thanks for bringing that to my attention. I have added the word thickened with the granache instructions as well as giving it its own instructions header to avoid confusion. Oh MY but this looks so delicious, inviting, rich and I think very hard to say ‘no’ to. It is a hard one to say no to a slice. wow!!! It’s so beautiful and looks very delicious. Perfect dessert for special occasions. I loved it. It really is a special occasion dessert. This looks delicious! 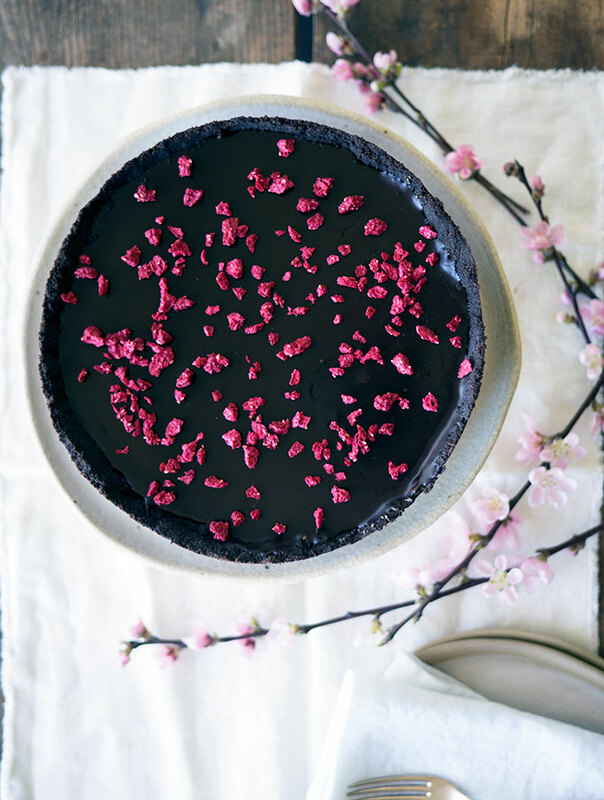 What a wonderful dessert to serve after a light lunch or dinner… and in the spring! Thank you Katie, it is a nice one to serve up to guests. Cheesecake is one of my favorite desserts, but when I’m thinking of making one, the first thing that comes to mind is, “Should I bake or should I not?”. I like it baked to get that dense and velvety taste. What I love about this baked cheesecake is that it isn’t too dense at all, but it really is velvety. Thanks Patty, she did turn out to be a lovely looking cake. This is just stunning, almost too pretty to eat! Awe thanks so much Sue, it is totally worth eating though. You totally could say Christmas of St Patrick’s Day! The freeze dried strawberries add that extra bit of red Christmas fun to the green. Thanks so much Tania, she did end up being quite a beauty. What a beautiful cake–perfect for any special occasion! Thanks for sharing! Thanks Elaine, it really is a special occasion cake. Thanks so much, it really is a statement cake. 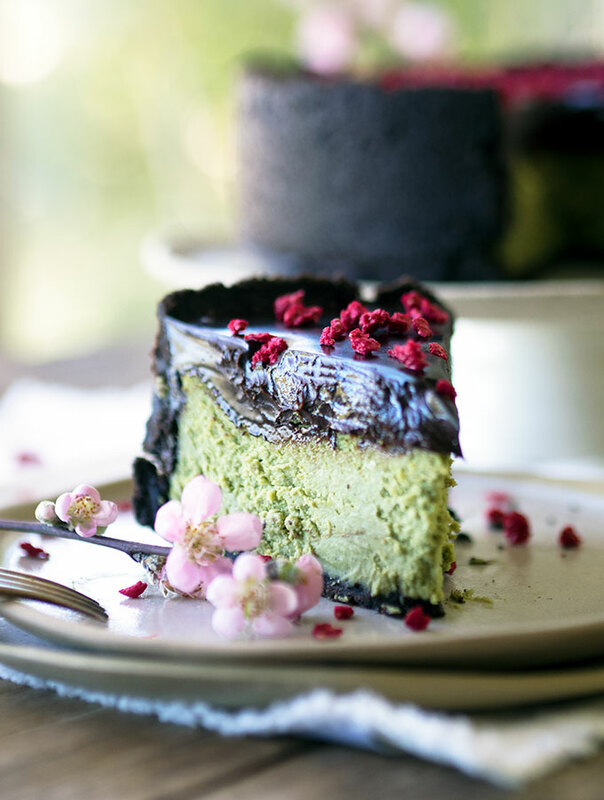 I love finding ways to use matcha, especially when it’s as gorgeous as this cake! Thanks so much Pam, I love finding new ways too. Wow, what a beautiful cheesecake! I bet those flavors would be wonderful! Thanks so much Rebecca, the flavours worked a real treat together. Hehe, that’s what we are here to do, make your belly rumble! Thanks so much Amy, it really is a great cake. This has such a fun color. You got the matcha blend right. Thanks so much Sandi, matcha can be a fickle thing to cook with at times. Love matcha in desserts. This cake looks so gorgeous and impressive! Thank you so much Christine, it’s definitely one for an occasion.